The ASX is looking more and more likely top break to new lows this year. We will be discussing the impact of this in the LIVE CHAT ROOM. If the ASX cannot close and hold above 5648, we are likely to see another retest of 5606. A break of this level however could see a sharp move into 5582, 5521 and 5504. If momentum is strong to the downside we cannot rule out a move to 5450. The DAX was obliterated last week and this bear market has accelerated to the downside. Like the DAX the S&P also experienced a very sharp sell-off last week and we now find ourselves at a critical area. We will be discussing this market in more detail in the LIVE CHAT ROOM. The Aussie dollar sold off every day last week amidst continued uncertainty across global markets. This week we find this market at a key support area. With more turmoil in France the Euro is now under pressure to stabilise above 1.1300. Can the Euro hold above this key handle this week going into the Interest Rate Announcement? The stage is set for a very big week in Cable, with the upcoming House of Commons vote scheduled for Tuesday. 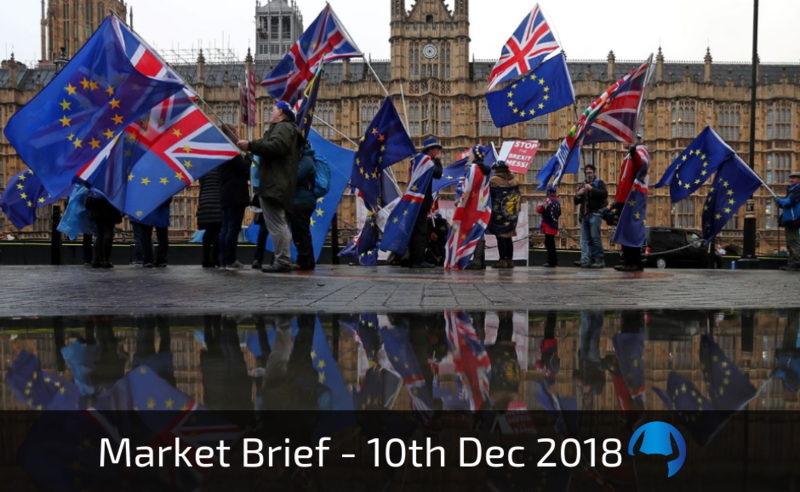 This will be a very important decision regarding Brexit prospects and we will be discussing this LIVE in detail in the MEMBER PORTAL this week. On the downside, should we fail to close above 1.2868, we will be watching the key 1.2720 level very closely. A strong break below this level however sets this market up for a bigger move down into 1.2622; and if downside momentum remains strong we could see a quick drop into 1.2480. The $/YEN has put in a short-term double bottom and the question now is will the $US find buyers? Last week we said watch out for a move very soon; and Gold has begun its swing higher. We are now at a very important area (1245-1247); and if Gold can clear this level we could see a sustained move higher into next year. For a continued move higher we would like to see this market close above 1260. Should this occur we could see a retest of 1276-1278 before a pause. A strong break above 1278 may likely result in a move to 1285; and if momentum is strong we cannot rule out a move to 1294.. If Gold cannot close above 1260, we will look for a move back down to 1245. A break below this level however could result in a very sharp move down to 1238, and if momentum is very strong to the downside we cannot rule out a move to 1222.